Weather plays a key role in summer swim and Saturday came in with a cool breeze and kept temperatures uncharacteristically cold for much of the morning. 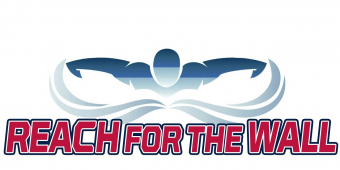 As the Bridlewood BWaves prepared to host the Victory Lakes Piranhas for their week four competition, most of the swimmers donned team sweatshirts to stay warm before their swims. Unfortunately, the bulk of the day’s swims reflected the gray skies and only about 32% of the swims ended up as personal best times – a thread that ran through the county as a whole. The meet was notable for the BWaves as it served as a final splash and farewell to a few of their teammates and coaching staff. Senior Alec Volles swam for the last time at home as a BWave after swimming and coaching with the team for the past twelve years. Alec will head to Radford University’s College of Business and Economics this fall. 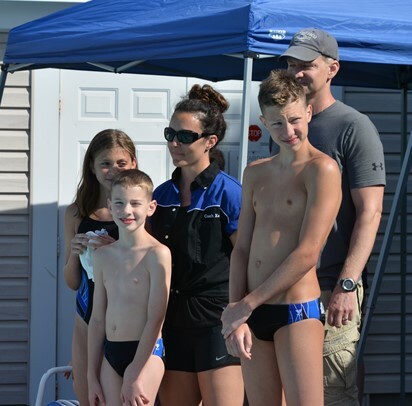 Also given a send off during the meet was the Eyre family – including Head Assistant Coach Kelsey and swimmers Blake, Elyse, and Grant – who will be moving before season’s end. 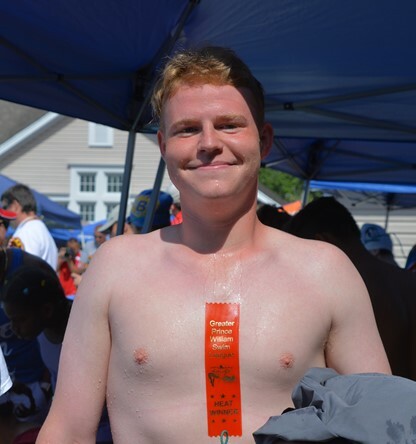 Senior Alec Volles captured the heat ribbon in his last home splash as a BWaves. Final Splashes (for now?) and Fond Farewell to the Eyre family participating in their last home meet. Eventually, the sun did come out and the day ended up as a fun meet filled with music, great weather, and solid swims. Although no team records were broken, the BWaves managed to notch another win on the season, finishing with a score of 2955.5 to 2261.5. The win moves the BWaves to 4-0 on the season as the prepare to head to Piedmont next week and match up against the Tsunamis – the other undefeated team in the league. Victory Lakes will host Kingsbrooke.